Applicants for work in the police forces of California must be U.S citizens of at least 20 years old, and with a diploma from an American high school. Yet on a bright spring day this year, Brett Smith, a 23-year veteran of Chico Police Department, was scouting for new cadets in a small town named Hlohovec, in western Slovakia, from where the path to the United States is scarcely trod. Smith’s prime candidates had been born and raised in the region, tested for durability and intelligence, and were now approaching the time they might be selected for employment overseas. They were each between nine and 12 months old and stood about two feet high. They had four legs apiece, a soft tan or sable coat and a set of teeth that gripped like a vice. Ribbons of drool, hanging from the jowls beneath growling snouts, glinted like rainbows in the sun. In addition to his role with the police department in Chico, Smith is a Canine Procurement Specialist for Vigilant Canine Services International (VCSi), a company that provides “world class K-9 solutions in complex detection, protection, law enforcement and security environments”. In this context “K-9” means living, breathing dogs — usually German shepherds or the similar Belgian malinois. VCSi is only one of a few dozen outfits that scour the world for able recruits to fly them back for deployment in the United States. In post-9/11 America, the demand for high-quality working dogs has grown to far outstrip home-bred supply. Decades of nurturing pooches for show, or to be rolled around the American living room as pets, has resulted in a drastic shortage of the kind of robust and obedient animals required for service in the police and military. Just when it is needed most, the American mutt has lost its bite. So it is that the west’s current conflicts, predominantly against the terror of fundamentalist Islam, is being fought with the weapons honed by its two previous principal foes. The Nazis and the Communists kept bloodlines strong and breeding programs assured through the wars and repressions of the 20th century, albeit often only as a means to their own terrible ends. The countries of the former Eastern Bloc, particularly what was once Czechoslovakia and East Germany, are now pivotal in the international working-dog market. The animals that once patrolled concentration camps and prowled impenetrable borders now fight the good fight in the world’s most punishing terrains. “I want to see Aaron, Johnny, Ziggy, Ashley, Leo, Mickey,” Smith said, reading from a clipboard and standing in a grassy plot at the end of a long dirt track, surrounded by the husks of seven cars and a decommissioned transit van. Lambs in neighbouring fields bleated beneath a baking sun, and only the bulb-shaped towers of unlovely post-Communist industry scarred a view over the vineyards of the Small Carpathians. Smith is 51 and around 6’3’’, lean, and with a brush of grey hair on his top lip. He is every inch the American police recruiter, even when more than 6,000 miles from home. 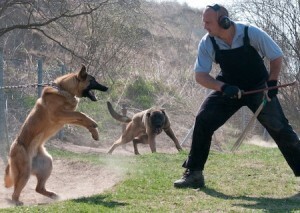 Over the next several hours, his potential enlistees — all German shepherds — appeared from a low kennels building to be put through their paces by a Slovak trainer named Marcel Dulanský, who also owns the school. Beads of sweat sparkled on Dulanský’s shaven head and his steely eyes were matched only by those of his charges, who strained at leashes, reared up onto hind legs and threatened to wrench from the ground the poles to which they had been tethered. Assistants let off firecrackers around the field as Dulanský provoked the dogs, rubbing their vulnerable undersides with a thick cane and cracking a whip off the turf. Balls of dust billowed from beneath scampering paws as they scratched and sprinted in constrained circles. Later they would be free, wrestling with Dulanský across the roof and windscreen of a car, and grappling in the back of the van. The animals launched themselves at their target from distances of more than seven feet, unerring in their trajectory and unforgiving in their bite. Dulanský’s left arm, heavily padded in a tailor-made leather gauntlet that resembles a modified orthopaedic boot, was crunched and mauled remorselessly. His long-sleeved T-shirt, new that morning, did not stand a chance. The dogs wagged their tails throughout, with ears pricked skyward, plainly enjoying their auditions for a ride to California about six weeks later and a lifetime of service across the state. All of them made the cut. Dogs have never been more prized as an asset in law enforcement, security and the military. They search for explosives, drugs, hostages and cadavers, anywhere from the mass transit systems of the American cityscape, to the battlefields and warlords’ bunkers of Iraq, Afghanistan and Pakistan. They can endure the most extreme environments and will work at a moment’s notice, expecting pay of little more than board, lodgings and medical care. Moreover they are strong and fearless and will parachute into war-zones or burrow beneath tanks, all as part of what for them is never much more than a game. The elite Seal Team Six unit that penetrated Osama bin Laden’s compound in Abbottabad last year was a notable recent triumph for Uncle Sam. But the only soldier from the unit who has been formally identified is a dog named Cairo, a malinois, who almost certainly began life in central Europe. About 2,300 working dogs are currently on duty with the US military, according to most recent official figures. Most will have spent some time at the 400-acre, 1,000-kennels training facility at Lackland Air Force Base, near San Antonio, Texas. Many will have come there via breeders in central Europe, training camps such as Dulanský’s and then K-9 agencies such as Smith’s. Smith said he had demand for between 120–200 dogs per year, almost exclusively for a police market, and was also visiting vendors in Brussels and Manchester on his European jaunt. Dulanský insists on selecting and training each dog individually, guaranteeing a high standard of serviceable animal for 12 months after sale. But the personal touch means he can accommodate no more than 45 dogs at any one time, and will usually work with them for between six to 12 weeks. When I visited, about a third of his current crop of dogs were already earmarked for a police force in Florida, another ten or so were only just beginning training, leaving eight available to Smith — not even one month’s demand. Throughout conversations during and after the training session, Dulansky repeated the word “quality”, in English and Slovak, at least 50 times, puckering his lips and pointing at the animals he had only just finishing manhandling. But his principal antagonists are sellers in the Netherlands, who he says are damaging reputations and distorting the market by creating a production line of poorly selected and inadequately trained dogs in an attempt the slake a never-ending demand. Neither Dulanský nor Smith would reveal the specifics of their financial negotiations. But Smith said later that the US importer will pay airfares (of up to £1,500 per animal, according to airlines) to take the dogs overseas, then train them potentially for another six weeks. Only then will they reach clients, who will pay between $5,000-$7,000 (£3,200-£4,500) per dog, ready and able to hit the streets. Margins are therefore tight, and a success-or-return policy exists at all stages of the chain from breeder to trainer, procurement company and client, where trusted long-term relationships are vital. Air travel, in particular can reduce confident dogs to traumatised mutts unfit for work, and a single dog’s failure can hit profits dramatically. All parties agree, however, that an attack of the nerves on the runway of an international airport is far preferable than while facing an armed insurgent in warehouse in Kandahar. The dog will be expected to detect danger and attack without command; cowering in the corner can be fatal. Before Cairo, the most famous — or infamous — dog known inside a tyrant’s lair was Blondi, Adolf Hitler’s loyal servant, who died beside her master in Berlin in 1945. The Fuhrer had an almost sentimental attachment to dogs, and stories persist of him walking Blondi in the forests around his bunker even as the allies laid siege to the German capital in the final weeks of the war. The tales are probably apocryphal, but Blondi was the most visible icon of the Nazis’ obsession with dogs, particularly those of lupine appearance, with whom they formed an almost totemic association. The animals would come to represent many of the ideals and horrors of National Socialism. The German shepherd was first developed around the turn of the 19th-20th centuries and formally registered by Max von Stephanitz, a dog breeder and cavalry officer in the German army. Von Stephanitz attempted to create a standardised breed in the model of a single dog he acquired in 1899, keeping meticulous logs of its progeny’s temperaments and achievements. Even as millions of people were slaughtered by the Nazis, the dogs were treated with great care. A core of about 30,000 animals were employed throughout the vast operations of the Third Reich, whose officers placed a emphasis on unadulterated bloodlines. Most chillingly, some of Von Stephanitz’s theories on the purity of species is believed to have informed the Nazis’ policies on eugenics. After the end of the Second World War, dogs quickly become an integral component of countless armies across the world, including in Britain and the United States. But with vast borders to protect and millions of prisoners to impound, the Soviet Union found particular utility in pure-bred canine soldiers. In the dissident Georgi Vladimov’s allegorical novel Faithful Ruslan, originally published and circulated only in samizdat in 1978, the strictures of Stalinism, and the unwavering adherence to its precepts, are depicted through the eyes of one such dog. The novel begins with the liquidation of a Siberian prison camp in the mid-1950s, as Krushchev set about dismantling Stalin’s enormous and unforgiving network. Ruslan is rendered unemployed and is left to fend for himself bereft of familiar routines, orders and habitual viciousness. In reminiscence and flashback, we see the dogs’ former life inside the camps, where a clear hierarchy places them above the prisoners. Ruslan remembers periods where he is sent away with his “bride”, and overhears officers describing their pride in the Russians’ intense and closely-monitored breeding programmes. In “God’s own country” — otherwise known as the high-altitude plains of southern Colorado — some of the next generation of elite working dogs are beginning careers with one of the most demanding, and at times controversial, dog trainers in the world. Alex Dunbar, a 49-year-old former marine, and son of an army dog handler, has simulated the rugged, mountainous terrains of Pakistan and Afghanistan on the 320-acre ranch that comprises the headquarters of his company, Close Quarter Battle K-9. Dunbar takes personal training a step further even than Dulansky: in more than 20 years he estimates he has trained only about 200 dogs, either for special missions in the military or for private clients including politicians and fan-stalked celebrities. He maintains a core unit of his best dogs, with whom he conducts often confidential assignments across the country. Indeed conversation with Dunbar is often short on specifics as he flirts with the boundaries of classified information. He details undercover operations where he has dressed as a hobo or a jogger, with dog, to spy on intelligence targets, for example. He says he has been shot at and been close to bombings, but that his hyper-trained animals provide security and aggression in a single package. Dunbar suggests more than 1,000 fatalities have been prevented by his exceptionally-honed beasts, which have found employment from Ohio to Israel. The CQB K-9 logo depicts a dog’s head, a sword and a Kalashnikov, and centres on the distinctive Lorraine Cross of the flag of Slovakia, from where Dunbar sources all of his animals. He has kennels near to the town of Partizanske, not far from Dulanský’s school in Hlohovec, and breeds exclusively from the much-coveted bloodlines of the former Czechoslovak state dog force. Last year, Dunbar created something of a media storm when he said in an interview that elite military dogs were being implanted with titanium teeth that can rip through Kevlar vests. He suggested that the reluctance of the U.S. Government to release photographs of Bin Laden’s corpse were because it had been so severely mauled by arguably the most ferocious animals under man’s control. Other training companies — including the owner of Cobra Canine in Virginia, which won a $550,000 federal contract to supply dogs to the U.S. Army — went on the record to rebut the sensational claims. But when Dunbar spoke to me in May, from a hotel room in Washington state, he not only repeated his beliefs but also said he was sitting at that moment beside a malinois with titanium canines. He forwarded as evidence a photograph via Skype of a snarling snout packed with metal. “Having something with that kind of jaw pressure, and the tenacity, the titanium teeth biting you…it’s like getting ripped up by a chainsaw,” Dunbar said. (A German shepherd’s bite exerts between 400–700 pounds of pressure per square inch, according to army data.) Dunbar added that the dogs are given a root canal when young and implanted with the teeth, which can cost up to $2,000 apiece. A spokesperson for the U.S. Army’s training programme at Lackland Air Force Base denied that any military dogs had titanium teeth. But other technological assistance is gradually making its way into America’s canine army, placing the animals at the forefront of high-risk and critical operations. Available kit includes body armour, cooling vests and specialised goggles (“doggles”) for desert-based work. And Dunbar also described prototypes of infra-red camera and communications technology, which will allow the dogs to be directed around dangerous buildings, with orders radioed from afar. The information the dogs assimilate can then be fed to strategists outside. Dogs are also gradually learning to differentiate for themselves between hostile threats and innocent victims, and to act accordingly. This duality of purpose is crucial in hostage situations, and leads from the dogs’ existing ability to be unforgiving in their daily occupation, but to return to a handler’s family home and be soppy with five-year-old children in front of the fire. It seemed for a split second as though the day in the sun watching a parade of perfect canine discipline was going to become a bloodbath. Not only Jana’s well-being was at stake, but also Dulanský’s reputation and a potentially lucrative business deal with Brett Smith. But as Jana managed to let go of her camera and made an effort to swat the dog away, the pup itself realised the error of his ways. He stopped, sniffed briefly at Jana, then turned tail and sprinted in the direction of the van, vaulting with terrifying precision at a relieved Dulanský’s forearm. Shortly after, Smith handed me a photograph of his dog Bak, with whom he worked for seven years in the police department and won numerous police dog trials. The dog, a German shepherd which originated in the Czech Republic, is now seeing out his retirement in the luxury of Smith’s California home. In the picture, posed in a studio, Bak is wearing a red cape with the red “S” of Superman emblazoned on a jacket strapped over his chest. It was a gimmick for children, Smith said, but on recent evidence the notion of Super Dog does not seem quite so fanciful after all.